I woke up with a headache, coughed up some yellow phlegm, blew my nose, and went back to sleep. I had come down with a nasty head cold before the Boston Marathon and thought I had shaken it — and it here it was nine days and a half a bottle of cough syrup later. But the sun was shining, and so I finally dragged myself out of bed a little after 10 AM. Odie hopped in the back of the car, and we headed off towards the Catskills. If I didn’t feel better, we could always turn around and come home. 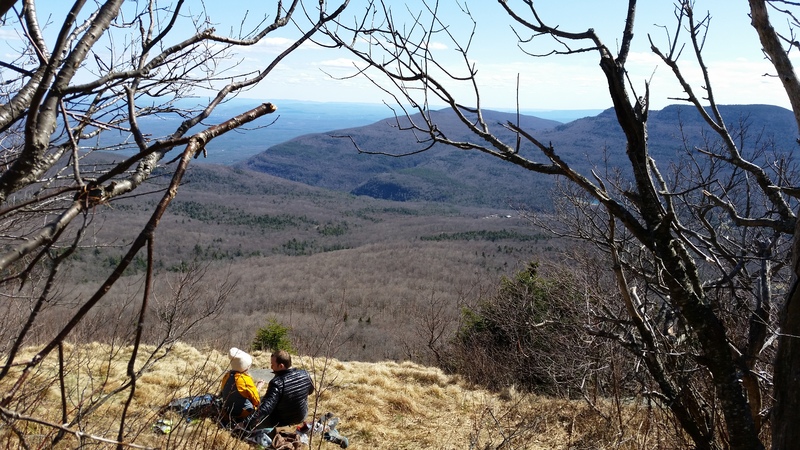 The plan was to hike Kaaterskill High Peak, one of the Catskills’ taller mountains, and a spot I would return to later in the summer as a part of a special challenge. This morning must have been the first truly beautiful day of spring, because the parking lot in Platte Clove was full. We parked on the shoulder of the road. 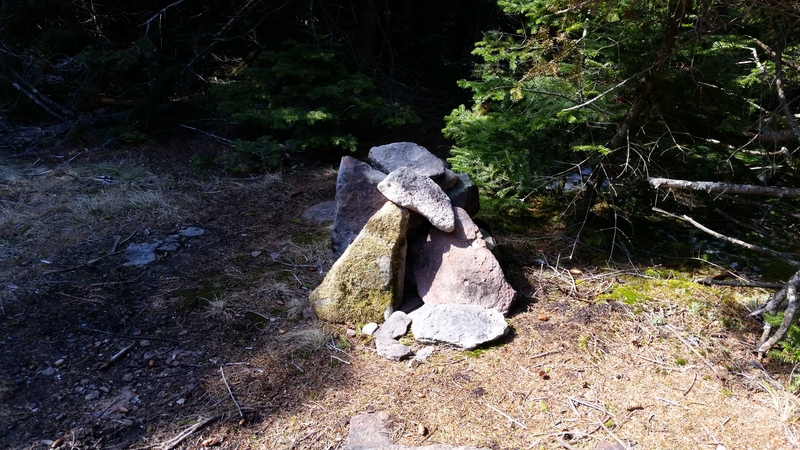 And off we went, up a steep old logging road and after a bit took a shortcut through the woods and linked up with a snowmobile trail that circles the summit. And then we discovered this wreckage. 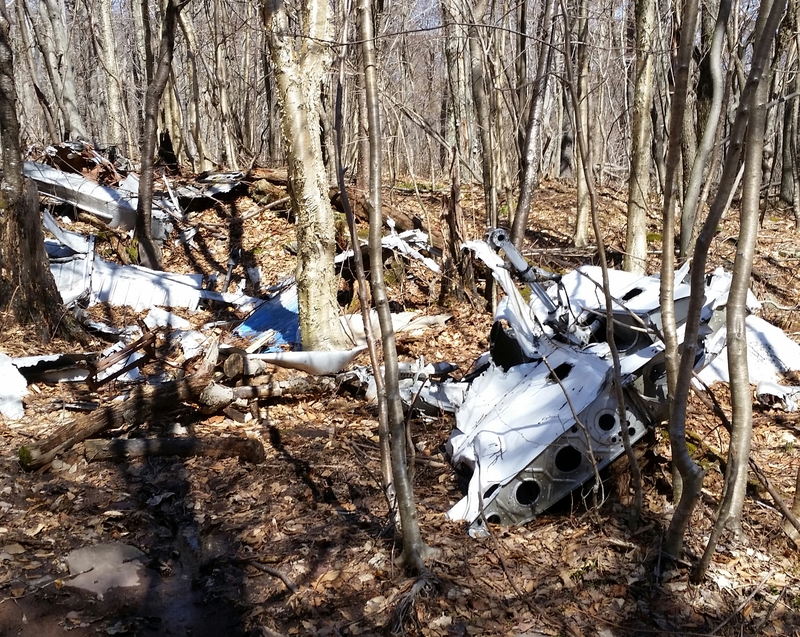 It looks like it was once an airplane. The day was sunny and warm, but a cold wind blew from the north, chilling me. I shivered, coughed, and blew my nose. Odie trotted along happily. We were looking for a turn-off where a trail was supposed to take us to the summit. 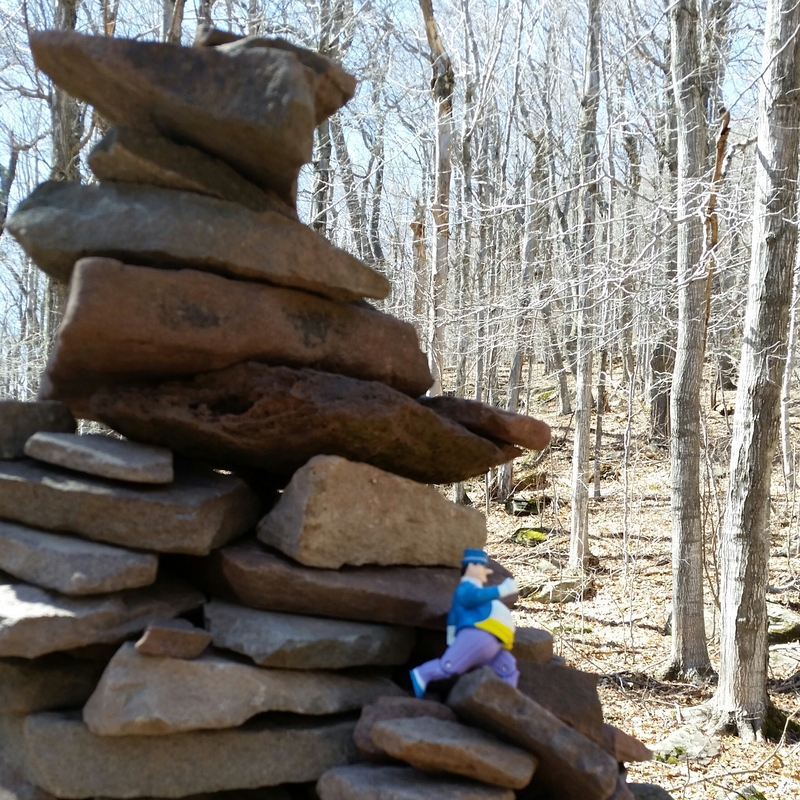 Suddenly we came across a large cairn; someone had considerately placed a figurine amongst the rocks facing toward the summit. What makes the Catskills interesting, is you never know what you might see. The footpath headed steeply uphill. There were occasional blazes on trees, but they were faint, and Odie and I had to guess our way among the rocks. I huffed and puffed. The path became quite steep and scrambled up a series of cliff faces. 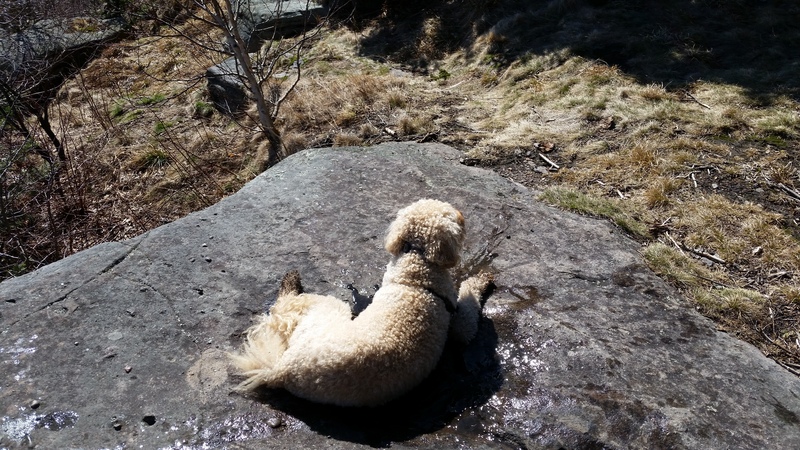 I put Odie on his leash and hauled him up and over several ledges which were too tall for him to jump. And then we got to the top of the ledge and discovered beautiful views across the Hudson Valley and Platte Clove. We could see the mountain wall across which the Devil’s Path traverses (Overlook, Indian Head, Twin Mountain, and Sugar Loaf). The Hudson River shimmered in the distance.. According to the map, this was called Hurricane Ledge. A couple was sitting on the ledge, enjoying the sunshine, shoes off, a picnic spread before them. Odie sniffed discretely at their food and scurried off as I clucked in disapproval. Then he discovered a muddy puddle which seemed just the right size to sit in. We headed north down the backside of the summit, aiming to complete a circuit of the snowmobile trail and then return on the logging road to the car. As we descended, the snow and ice got thicker and more treacherous, and in some places the slope was quite abrupt. At one dicey spot, my feet slipped out from underneath me, and I slid out of control for about three feet, becoming quite angry. It seemed inconsiderate to leave so much snow out on a beautiful spring day, and how was I supposed to have known to bring micro-spikes. I glared at the mountain, blamed the couple on Hurricane Ledge for not advising us of this hazard, and blew my nose. 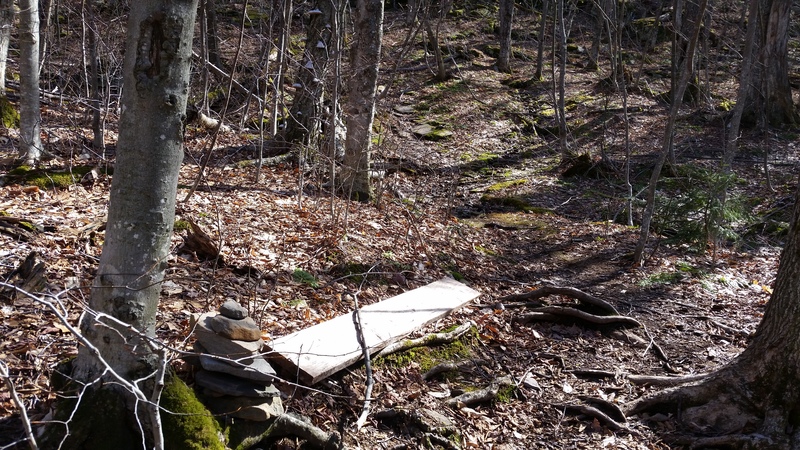 We survived the descent and found the snowmobile trail It was helpfully marked with a wooden plank. The snowmobile trail was covered in puddles, and we slogged through mud and water — but we’re used to that. On the way down the logging trail, we started to run. 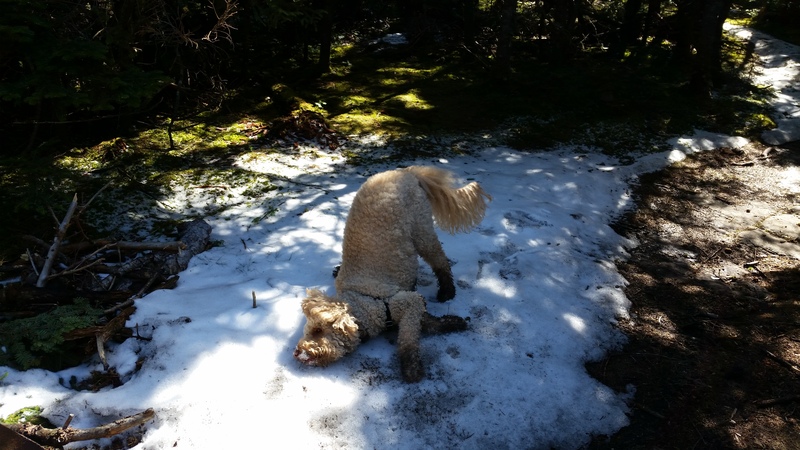 Odie was pleased to have gotten in an 8-mile hike, and an added positive: he had covered himself in mud, which seems to be a favorite practice. The afternoon sun was still warm, the sky was clear, the wind was calm, and as we trotted down the last few hundred yards, I noticed my cough was gone. I blew my nose and felt quite happy. Ken, your stories are so wonderful and entertaining. Thanks for sharing your experiences.